Fire at will to destroy the waves of incoming enemy saucers and protect the Earth from the alien invasion! 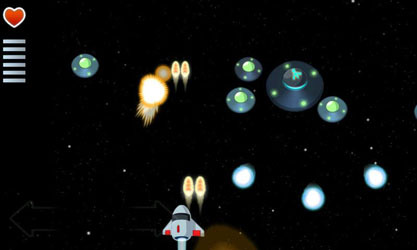 Gameplay: This is a simple game where you fly a spaceship and shoot anything that moves. There’s an onscreen D-Pad for the left thumb and a shoot button on the right hand side. For those of you who have multi-touch issues like on the HTC Desire, then you’ll be pleased to hear that the menu button is configured to be the firing button too. (So no issues with shooting accidentally interfering with the movement). 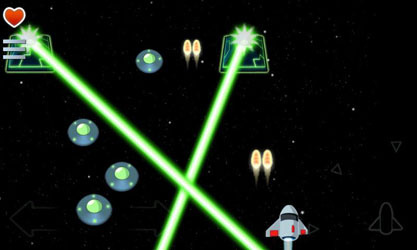 Alien Defence 101 really is shoot at everything – so you’re on a wide vertical flight path where you can strafe left and right. Aliens will fly down towards you and your aim is to prevent anything from getting away. The enemies will travel with a variety of flight patterns, and they exhibit different characteristics. Every now and then, there are special gold saucers which drop power-ups if you destroy them. You also have a Captain who pops up on the screen with messages to goad you on. Before you think this sounds just like Xenon – no it’s not, it doesn’t feel like that. There’s a 2.5D feel introduced by a slight tilt in the perspective. So as you get to the edges of the screen, then your direct forward shots will be tapered diagonal towards the centre of the screen… so the playing field looks like a trapezium with some depth. When you start the game initially, there are 3 missions (Space, Earth & Arctic), which each have 2 difficulty levels. Within each mission there’s a few stages – enough to keep you happy. If you complete more areas, then you unlock new missions. Cool parts: There’s nice stylisation with good graphics theming and decent animations. The sound effects work well and match the game. There’s particularly good use of accelerometer to shock you when you get hit. Generally the game runs very smoothly on my HTC Desire with only a few momentary jerks. I spent a decent few hours happily playing this game. I would say there’s a medium amount of variety in the enemies, and the flight patterns. There’s still a fair amount of skill required to get perfect rounds. Overall, for a free game I think it’s a must try. There’s a decent amount of good game content in it, and it feels great to play! i purchased a weapon upgrade for $1.99 for the game. my cc was charged and i recieved nothing. You should contact Rocket-in-a-bottle Developers. If you give them the name you used for the purchase, then they can use their Merchant tools to give you a refund. However, I just did a quick search to find a contact and there’s very little to be found. Their website http://www.rocketinabottle.com redirects to their blog which is very app focused and doesn’t even mention their game. An alternative way is to login to https://checkout.google.com/ and find the entry in the purchase history. When you view the order, you’ll be able to find contact details. If that doesn’t work then you may need to email Google Checkout directly to get the problem resolved. Hope this helps! Please tell us if you manage to get your money back!